Vino Slush Frozen Wine and Cocktail Slush Mix! Just mix with any kind of wine and water. Mix it up and stick it in the freezer for a delicious, refreshing slushie drink. It's the new way to drink wine - a wine slushie for grown ups! 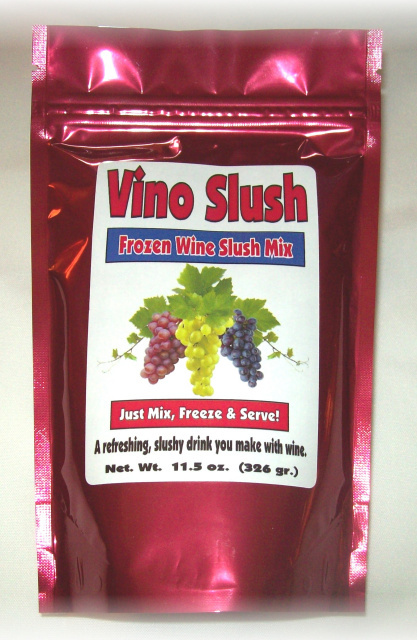 Vino Slush is our frozen wine slush mix. All you do is mix the wine slush mix with any kind of wine and water. Then freeze it and serve. Or you may use our wine slush mix with a blender for faster results and a smoother product. Either way, you're going to love our wine slush mix with parties, evening sunsets, summer picnics, or just plain relaxing. Vino Slush is as sophisticated as you want it to be or as casual as can be. The wine slush mix adopts the profile of your favorite kind of wine. White, Red or whatever your pleasure - it's just more refreshing when it's frozen. FREEZER VERSION: Combine entire Vino Slush mix with one 750ml bottle of wine (a little more than 3 cups). Fill empty wine bottle with water and add to mix and wine. Stir until mix is fully (important) dissolved. Freeze for 4 to 7 or more hours. May need to thaw a while to stir with spoon to proper consistency. (Note: Sometimes the wine flavor sinks to the bottom while freezing. Make sure you dig down all the way to the bottom of your container to thoroughly mix the entire frozen batch.) Makes 15 - 16 four ounce drinks. USING A BLENDER: Put 1/2 package of Vino Slush mix (3/4 cup) into blender with 12 ounces (1 and 1/2 cups) of any kind of wine. Blend until fully dissolved. Fill blender with ice until full. Blend until smooth. Makes 8 four ounce drinks. FROZEN DRINK MACHINE: Vino Slush works great in any kind of frozen drink machine. Just follow the directions for the Freezer version, then just pour it into the machine instead of putting it into a freezer. Perfect consistency every time. Wineries use a frozen drink machine to sell drinks and offer samples. This also propells the sales of the packaged mixes for customers to take home. They will use the wine they buy from your winery to make their own wine slusies at home. NON-ALCOHOLIC VERSION: Use non-alcoholic wine, ginger ale, grape juice, cranberry juice, pomigranite juice or apple juice. Wonderful in a crock pot. We have found that our customers love the Vino Slush as much for warm holiday punch as much as they do for a summer slush. Delicious right out of the crock pot. We are needing to order for our holiday open house that is scheduled for Nov. 5,6,7,8. I've been thinking about trying a custom label for the pouches this year. Please let me know your suggestions and pricing options. 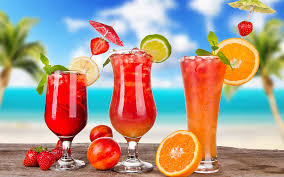 Make many of your favorite cocktails using our Vino Slush such as Tropical Rum Punch, Bourbon Slush, Strawberry Margarita, Peach Bellini, Lemon Vodka, Vodka Cranberry, Screwdriver, Cosmo and more. Just use your favorite liquor instead of wine. Find some example recipes on our COCKTAIL RECIPES page (CLICK HERE) or make up your own recipes. Look for Vino Slush at retail stores across the country. If your local merchant doesn't carry Vino Slush, tell them about it. America's favorite wine and cocktail slush mix!